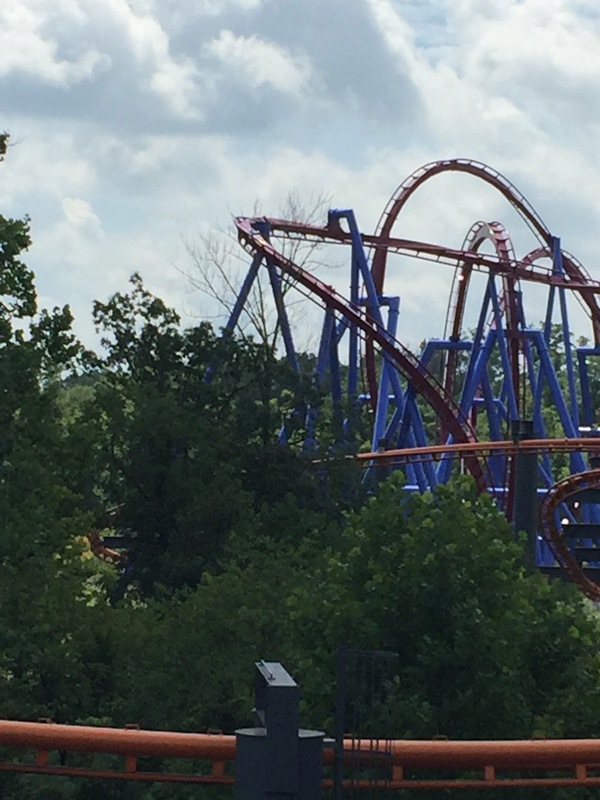 Kings Island was the first big coaster park I went to as a kid. It was way back in 1979 or so and I went with my aunt Diana and my dad. I was only 8 but I was so pumped to ride the rides. When we went back today, and Michele for the first time, it was like I was a kid again. This park was the park all of the local kids in my town went to. It was only a couple hours from where I grew up and we always went here instead of Disney World. We bought passes for this park when we bought the platinum pass at Cedar Point. 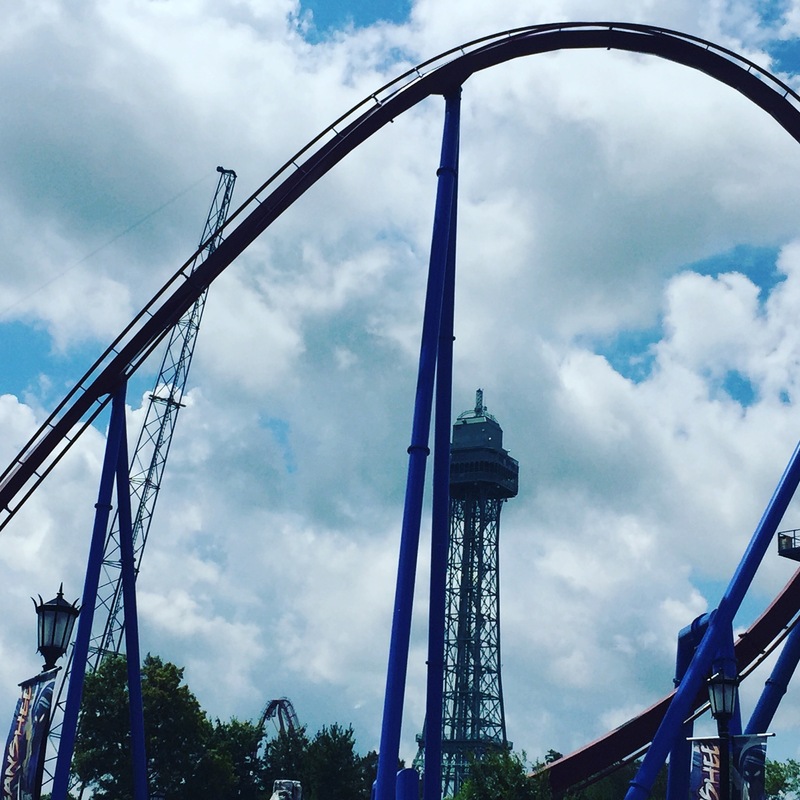 Remember I said that if you buy the season pass at one park you can go to any other park in the “family.” On this trip we would visit Cedar Point, Dorney Park and Kings Island all for about the price of one visit. 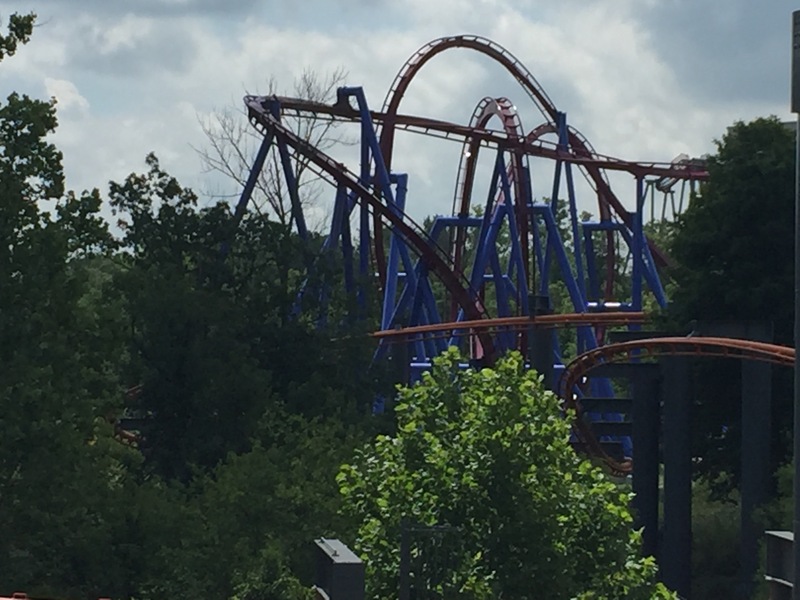 Kings Island’s sister park is Kings Dominion, a park that we visited last year on our first roller coaster tour. At that park they have Grizzly. Here they have one of the best and longest old school woodies in the world, The Beast. The Beast was the first coaster we headed to as soon as we got into the park. Since we bought the Fast Lane pass we got on within minutes. This was one of Michele’s favorites of the tour. . 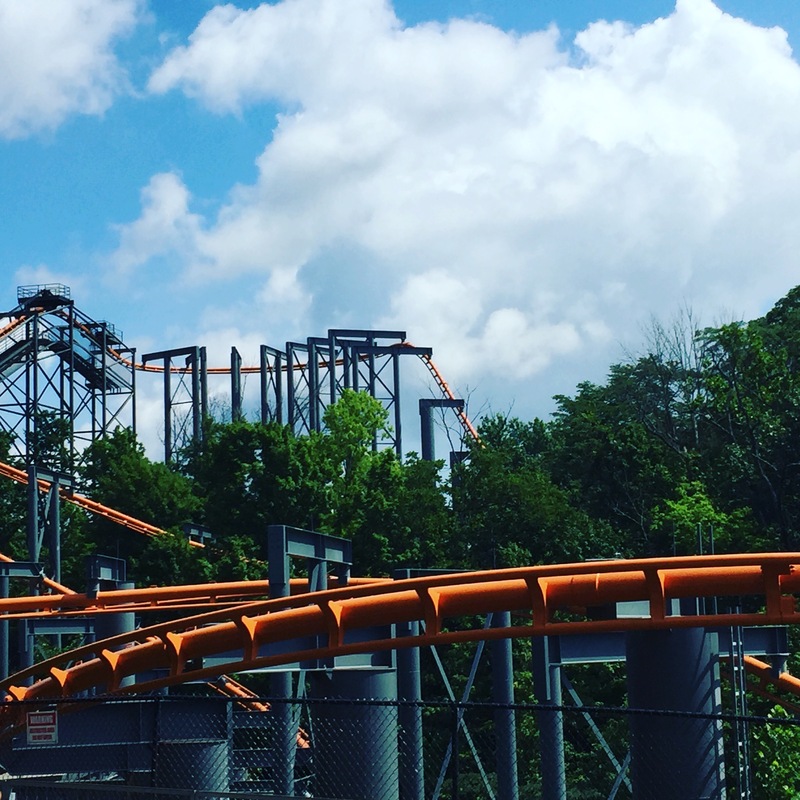 It has about a 4:30 minute ride you’re traveling through the woods at nearly 70 mph and it has the best finale of any roller coaster on the planet. If this isn’t enough of a ride during the night is even better. You literally cannot see your hand in front of your face on this ride during the night and the tunnels are just amazing. 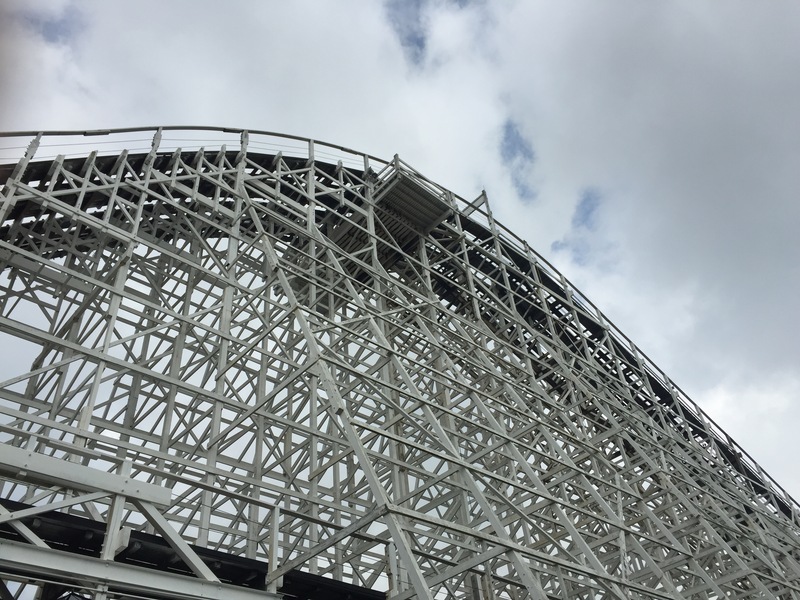 After a jaw dropping ride on The Beast we made our way around the park riding; another old school woodie, The Racer, Vortex, and the Adventure Express before we headed to the back of the park to ride Banshee! 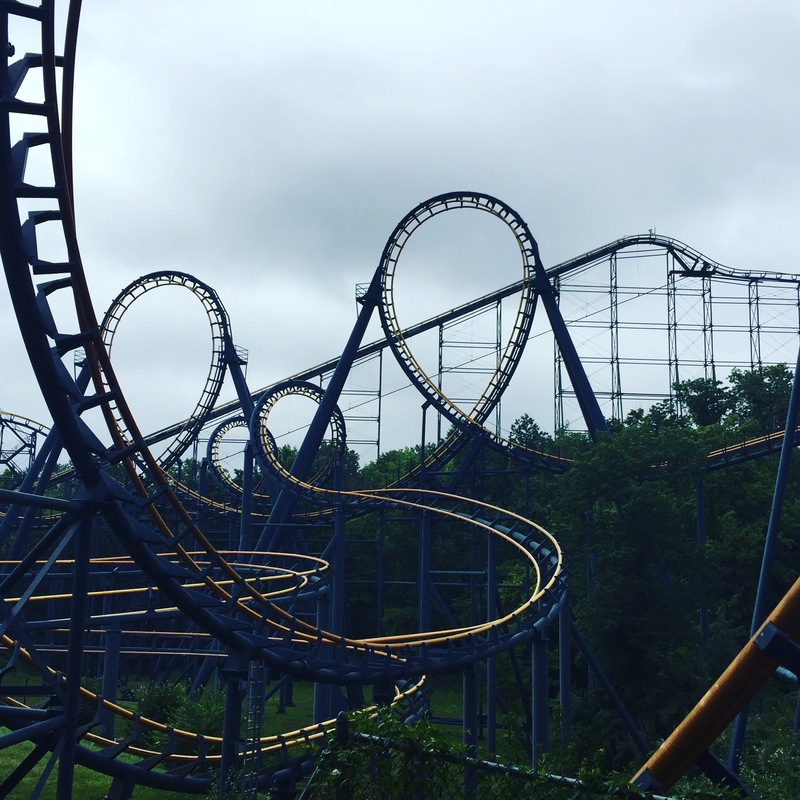 On this coaster, riders will scream their way through 4,124 feet of track and seven stomach-churning inversions at speeds up to 68 mph on the world’s longest steel inverted roller coaster. After the Banshee we headed over to The Bat. This coaster is set all by itself and if you aren’t careful you will miss it. It is one of the old school suspended coasters that were popular in the 80s. On this coaster: In the shadows of falling darkness, wings of the night creature await their silent signal from the moon. Flying madly through a starless sky the frenzy flight of the Bat takes you by surprise and leaves you breathless, hanging in mid air, captured alive. Fly the Bat. It’s a non-stop fright. Of course we had to ride the indoor and super fast, Flight of Fear which is the same coaster that is at Kings Dominion and then over to Vortex and Invertigo to what Michele calls a concussion ride. Once the Vortex gets you in his grip, you’re his forever! 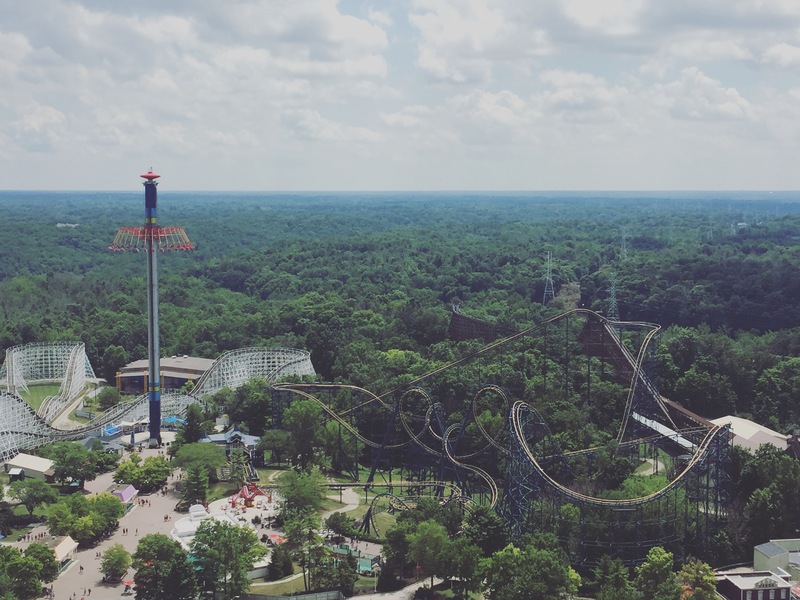 You’ll be rocketed through 3,800 feet of track at speeds exceeding 55 miles per hour through two vertical loops, double corkscrew, boomerang turn, and a 360-degree helix. We ended the day with Diamondback and it was a ride you won’t forget! 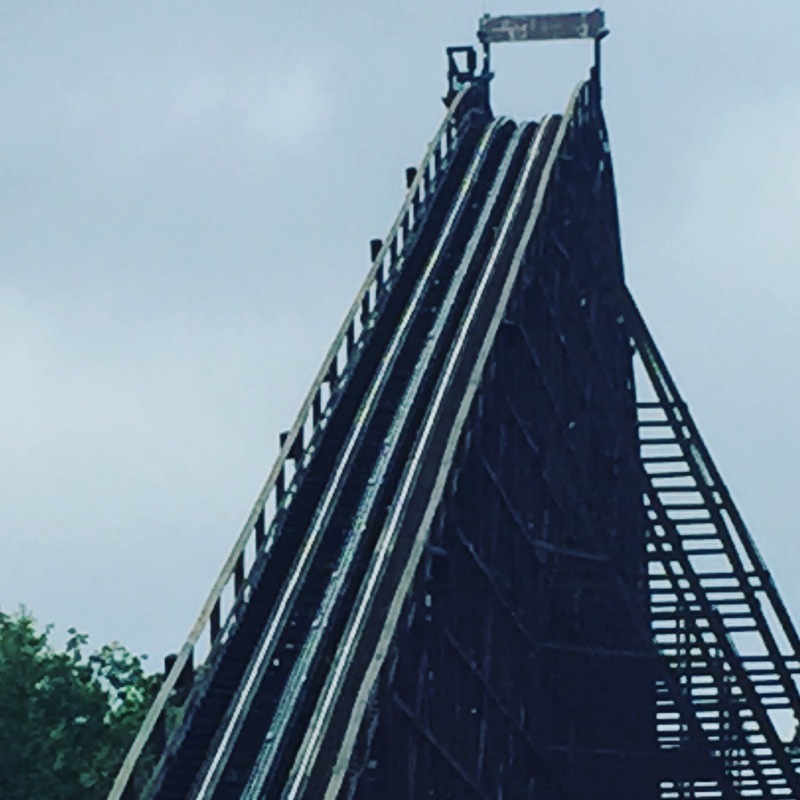 After the train leaves the station, it begins its ascent up the 230 feet chain lift hill. Once reaching the top of the hill, the coaster drops 215 feet at 74° over the Rivertown midway reaching speeds up to 80 miles per hour. It then curves to the right up a 193 feet hill and down the drop into the ravine, curving again to the left. The ride then ascends a 131 feet camelback hill and drops, curving left into the hammerhead turn. After dropping out of the hammerhead, the train travels up a 129 feet hill (which has a trim brake). 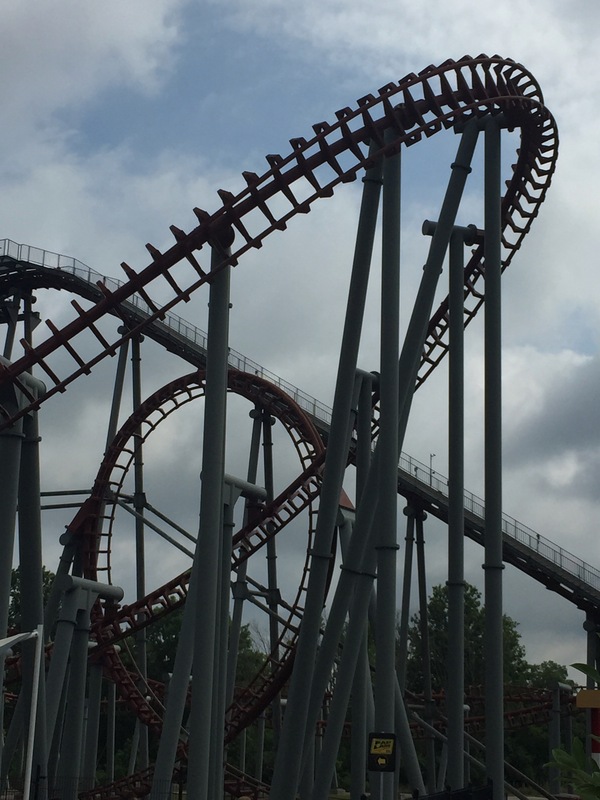 After the fourth hill, the train turns into down into a 287° counter-clockwise helix (on-ride photo camera is here) and into the mid-course brake run. After the short brake run the train drops down into the ravine, raising into a bunny hop hill, then into another bunny hop and into the final clockwise helix of 323°. After the final helix, the train passes over the Rivertown midway a second time and drops into the splashdown finale, slowing the train down and leading it into the final brake run. After braking, the train takes a left U-turn and heads back into the station. One cycle of the ride lasts about 3 minutes. Diamondback is the first hyper coaster to feature a splashdown. Scoops positioned at the back sides of the last car on each train send water soaring at heights of 50 ft as the train passes. The riders don’t actually get wet in the splashdown. Splashdowns are used for a visual effect as well to slow the train down. The splashdown is located in the former Swan Boat pond. Diamondback operates with three open-air stadium style steel and fiberglass trains. The trains are the same prototype trains seen on Behemoth at Canada’s Wonderland, Intimidator at Carowinds and Shambhala: Expedición al Himalaya at PortAventura. Diamondback was the first roller coaster in the United States to feature the new trains. Each car seats four passengers, with two front seats set near the middle of the car and two rear seats set closer to the sides of the car. The front car of each train features a yellow/orange snake head with long fangs, while the inside of the trains are black, red, and orange. Riders are restrained by a single T-shaped lap bar and a seatbelt. There are three trains total, each train featuring a different fin color: green, red, or brown. Under the sides of the last car on each train are the scoops for the splashdown at the end. The steel track is 5,282 feet in length and the height of the lift is approximately 230 feet. The supports on the first lift hill and part of the second hill are yellow while the rest of the supports are tan. All of the track pieces are red. The track was fabricated at the Ohio-based Clermont Steel Fabricators. What a day! We jumped back in the car and headed toward Chicago. Before we got to the Windy City it was a long drive through cornfields and soybeans in Indiana. As we got closer to Chicago we started seeing billboard ads for attorneys and started blowing through toll booths. Yep, we didn’t pay a single toll in Illinois and we would get a bill for it later from Enterprise. I guess the cat is out of the bag by now that we took the truck out of state. We arrived in Chicago and it was our mission to find the best deep dish pizza in the city. We found a little shop, Pequod’s. I let Michele out on the corner so she could put our name in and I found a place to park. This area of the city reminds a me of Boulder, CO. It was full of trendy bars and lots of hipsters were checking their phones in their tight jeans and long beards. You know the crowd, those wearing beanies with their hair pomp’d just so sticking out the front even though its July. It was a long wait, over two hours. So long that I went next door for a bite of sushi while Michele held our spot on the bench. She doesn’t like raw fish and I am not a fan with any thing that includes rice. I know, right, why in the world would I be eating sushi? After dinner we got lost finding our hotel. The Aussie speaking GPS dude sent us all the way over to the south side of Chicago when our motel was near O’Hare. It was a modest Motel 6 with a too hard bed that broke the definition of a double. This would be the first time on our trip where we would spend two consecutive nights at any one spot. Michele and I would have just one more day together before she returned home to Alaska to work for a week, pick up Rags, the service dog and meet me in Texas. But tomorrow we would visit another Six Flags park and have dinner with a friend of ours, Pat Moon.